Today she was feeding the pigeons at Marble Arch. They know her and flock to her for her breadcrumbs. She feeds them, then sits down to have a cigarette and a bit of a chat. She's adorable! I call my husband the "duck man" because he always visits and feeds the ducks at his work. They see him from afar and start quacking and wait for him...they are so cute! Perfect jouranlistic photo. Love the motion of the flying birds. She's like that woman in Home Alone 2. I love that someone feeds the birds. Tuppence a bag. Reminded me of "Mary Poppins" song! ..."you know they are smiling...Love the picture! I agree, it's a Mary Poppins moment. Nicely done. Nice tight framing, candid catch and I like the movement from the motion blur. Great shot! Wow, great motion! This remind me my childhood, that chasing those birds, feeding the popcorns at small park (in Japan). Good memories. It is nice that there is a bird lady and that she cares. The photo is really nice too. Great photo and story. I'd chat with her. I have nothing against pigeons, but many people in our cities hate them... so many, too many? Most people would probably not appreciate that you feed them, but how could you be angry with a nice old lady who makes it for their pleasure... and for her own? Your picture is anyhow really nice! I like how you always take pictures with stories behind them. Good shot! We have bird ladies here. I never see bird men, just bridladies. 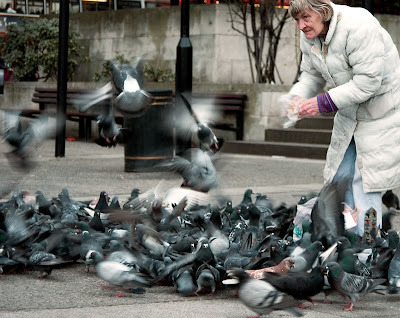 Hasn't every city in the world got "a bird lady"
What a perfect capture (and brief narrative)of life. This is so elemental. What a great shot. I love that some of the birds are in motion. I don't understand the previous comment about a smoking pigeon. This photo is really beautiful. I haven't read your profile, but I hope you're employed somewhere as a photojournalist.